- Stunning Downtown San Diego Condo Next Petco Park East Village- Gaslamp!!! This Beautiful 2 Bedroom, 2 Bath PRIME ICON condo comes with 1100 sq. ft. of living space in A newer and secured building, allows lots of sunlight through its 10ft floor-to-ceiling windows. Expect a well-constructed property with sound insulation, situated in the Highly Desired Icon Building in East Village, this is a Corner unit with spectacular views of the courtyard & city Lights. Two bedrooms with Queen size beds (with oversized showers and bathtub) and a Master bedroom w/ walk-in closet. Kitchen (granite top) and Stainless-Steel appliances, Kitchen is fully equipped plus separate full dining area. Very roomy. State of the art finishes. The unit has hardwood floors throughout (Bedrooms Newly Carpeted) custom paint, High-speed internet/ WIFI w/ Private balcony with table and chairs. washer and dryer in unit. Plenty of sheets, towels and down comforter. Courtyard-level 5th Inning Lounge available to Icon residents for meetings, special events, community etc. Convenient trash chutes on each residential floor. Please check the Availability calendar before inquiring there are a few months completely booked so make sure they are not your target dates? Thank You. 30 Day min. on all stays! I will be available for any questions or concerns throughout their entire stay, other than that I give them their privacy to Enjoy Beautiful Down town San Diego. The neighborhood This property is in Downtown San Diego's East Village, a diverse and vibrant community with a unique mix of arts, culture, and entertainment. This area has been described as the largest urban neighborhood in downtown San Diego. The thriving urban enclave is home to more than 700 businesses including restaurants, hotels, and art galleries. East Village houses the San Diego Padre's Petco Park, the Harbor Drive Pedestrian Bridge (connecting the San Diego Convention Center area with Petco Park), San Diego's Central Library, and the famous Mission and Stone Brewery.Getting around there are many options for getting around the area. This area has a Walk Score of 96 out of 100 (Walker’s Paradise so daily errands do not require a car). There is a full grocery store a few blocks away (Albertson's at 14th and Island), and public transport is two blocks away.Downtown San Diego also offers a unique free and green option for transportation called FRED - Free Ride. FRED works similarly to Uber, but offers free transportation throughout the downtown area. Lyft and Uber are easily accessible. There are also cabs around. The trolley and bus station are walking distance away. The airport is a few miles away. I Live and Work in San Diego, Its a beautiful place! Perfect Weather and lots to do! I I enjoy meeting all the interesting people that I end up meeting from VRBO. Walking to every hip Bar or Club, walking distance to the convention center. Petco Park, Prime Location in East Village in Stunning ICON Building! My place is cozy, yet modern. We take very good care of the unit it and we always check on it before and after each stay to make sure its stocked, clean and ready to go, Many owners do not do this and it makes a difference. Central AC in unit cools the entire condo in 5 min. High quality linens for each bed, as well as 3 other sets for each bed if you want to change them for any reason. High thread count DKNY, Ralph Lauren Duvet Covers. We enjoy buying quality linens. Stackable washer and dryer in unit. Laundry soap , softener , PODS and bleach always provided to guests. Beautiful fitness room with free weights , tons of high tech machine and all the cardio equipment one could ask for. Lots of basics for cooking, Spices etc. Super property close to everything. Fabulous apartment with a super rooftop to watch the sunset. Clean and close to everything. Heather was punctual in responding to all our needs and easy to work with. We had a great week. Would love to return one day. Incredible home in a perfect location! Heather was an amazing host! She is very accommodating and was a pleasure to work with. The home is beautiful and a short walking distance to Gaslamp, Petco park, the convention center, and just about everything you need. The views from the rooftop deck are incredible. We will definitely stay here again next time we are in San Diego. Great Time in San Diego! My husband and I, and another couple spent a week in this condo in the Gaslamp District of San Diego. The property has a great location, with easy access to many restaurants and shops. It is also an easy walk to some of the great San Diego attractions like the Midway, the farmer's market, Balboa Park, and the harbor for the ferry to Coronado. 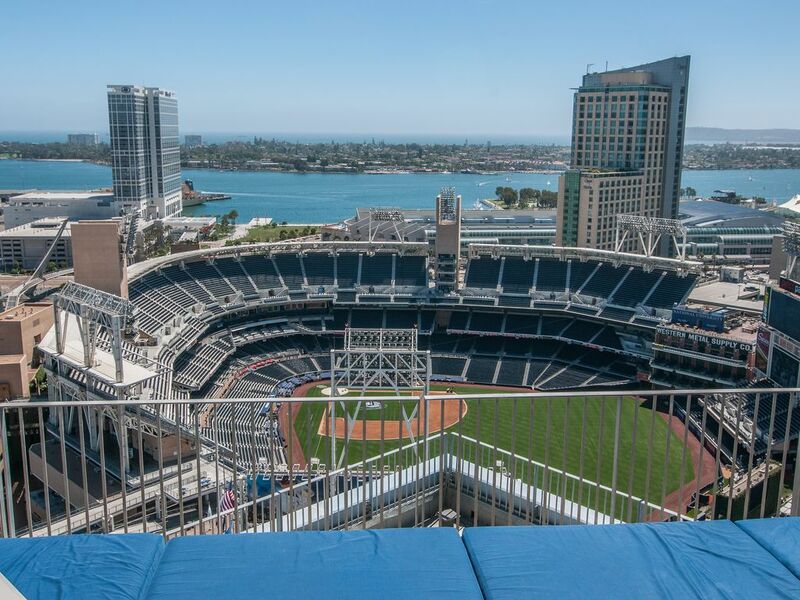 We enjoyed the rooftop patio that allowed us a great view of Petco Park. The condo was perfect for two couples. We each had a spacious bedroom with a gorgeous bathroom. The great room was a wonderful space after walking the city, with adequate seating for viewing the TV, a table for a bite to eat, and an eat at counter for a quick snack. The wall of windows allowed us a bright sunbathed view of the surroundings. A small balcony was perfect for morning coffee. Heather replied to any of our questions with a very quick response, and took care of anything we were concerned about. We would definitely stay here again, and have encouraged our friends who travel to consider this condo. What a great property in a fantastic location! We truly enjoyed our stay . Heather had a good communication line. Would highly recommend this Gaslamp district condo ! Comfortable condo and in a nice area close to the things we wanted to see. A lot of restaurants within walking distance. Would recommend this place who wants to stay in the Gaslamp district. Great for people who enjoy the night life. WE HAD A WONDERFUL TIME,. EVERYTHING WAS COMFORTABLE AND CLASSY. THE ONLY MINOR COMPLAINT WAS IT WOULD BE MORE COMFORTABLE IF THE BEDROOM HAD A BED WITH A BOX SPRING MATTRESS- THAT WOULD RAISE IT UP MUCH HIGHER.,, WE PRACTICALLY WERE SLEEPING ON THE FLOOR. WE WOULD RECOMMEND THIS TO OTHER FRIENDS. I just wanted to clear up this review for people looking at it with confusion. Nancy stayed here with her husband in December and everything with the reservation went great. A couple weeks after Nancy's departure she wrote her review for our property she accidentally checked one star (instead of 4 stars) when submitting her review. Nancy noticed the mistake (clicking 1 star) she made and immediately called me and left me a voicemail about the mistake. She said she left a good review but that she accidentally picked one star instead of 4 stars. The following day I called Nancy back but was unable to get a hold of her (b/c she was out of town on anther trip to Florida) but I did get in touch with her son (who I had originally talked to several times prior when they were booking the reservation, b/c he said he was more proficient with booking online reservations than his parents were) and we called VRBO together, the customer service rep. told us there is no way Nancy could correct (or edit) her review on VRBO because all reviews are final. The customer service rep told me that the best thing for me to do is to leave Nancy my response to her review and explain the entire situation that Nancy had accidently checked the incorrect number of stars and that she was unable to correct that mistake. I appreciated Nancy reaching out at all and letting me know what happened, Nancy and her family are invited back anytime. Thanks again! Rates are not final until reservation is confirmed. Cancellation Policy is on contract, I do not honor 100% refund on Cancellations that are within a 90 day time frame from arrival. Except for situations like a death in the family or a medical situation. I am reasonable of course! I usually refund the damage deposit within 24 hours after departure,if there is no damage which happens like 1 in 10,000 guests! VRBO keeps the deposit and refunds it automatically 72 hours after departure if I forget for some reason but I usually do not. Thanks We offer discounts for long term reservations. We also offer discounts for Military, Job relocation & government employee for long term stays.